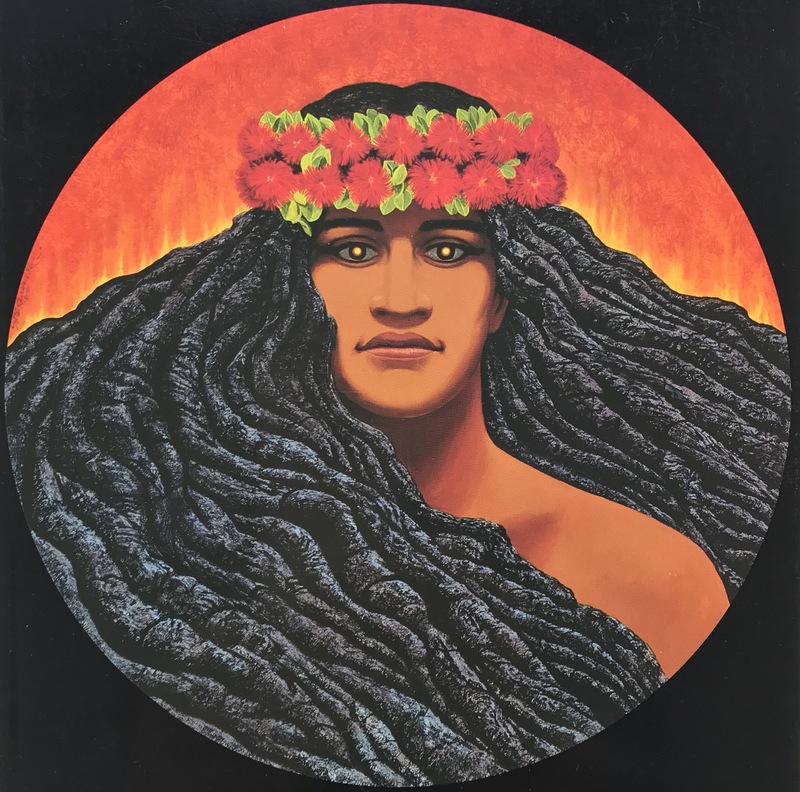 My first encounter with Pele, the Hawaiian Goddess of Volcanoes, was in 1992 at the conference of the Ecological Society of America held in Hawaii. She made a deep impression on me in her form as a young, strong woman – her hair and eyes representing flowing and glowing lava respectively. Science, animist beliefs and their interplay have captivated me ever since. Source: ‘Pele‘ by Herb Kawainui Kane. The formation of the Pu’u ‘O’o cinder and splatter cone on Kilauea Volcano shows the immense energy being released from the magma chamber below the earths surface. Kilauea is on the Big Island of Hawaii and is Pele’s home. Source: GE Urlich, United States Geological Survey (1983). 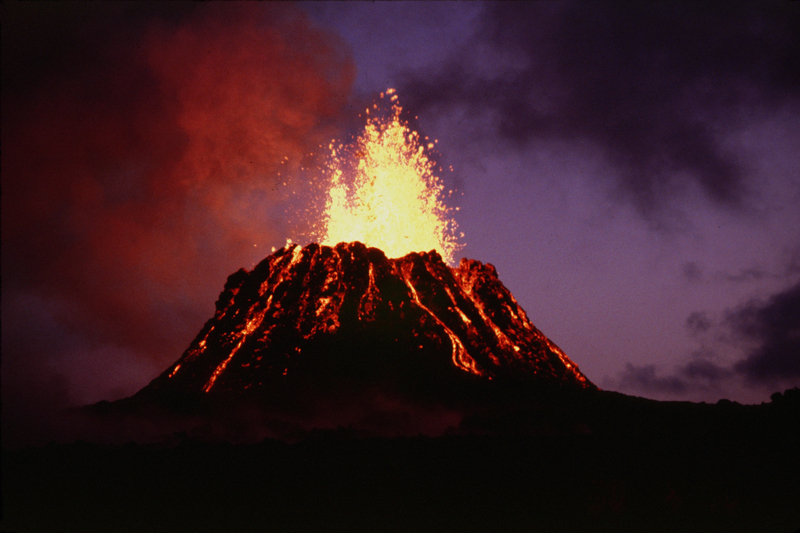 Of the 600 or so active volcanoes in recorded history, around 20 are erupting at any given time. In 2018 the Kilauea Volcano in Hawaii and Mt Agung in Bali attracted the world’s attention, largely because of their impact on people’s homes, livelihoods and travel plans. Kilauea is the most active volcano in Hawaii. It’s most recent eruption began in the East Rift Zone on May 3, 2018 and paused in early August. Earthquakes and volcanic activity are often linked and Kilauea is no exception. A 5.0 magnitude earthquake occurred before the eruption on May 3rd and a 6.4 magnitude earthquake followed on May 4th. The United States Geological Survey (USGS) reported these were related to the eruptive events. A number of vents and fissures opened on the lower slopes of the volcano releasing flows and fountains of lava that destroyed homes and other infrastructure on Hawaii’s Big island. 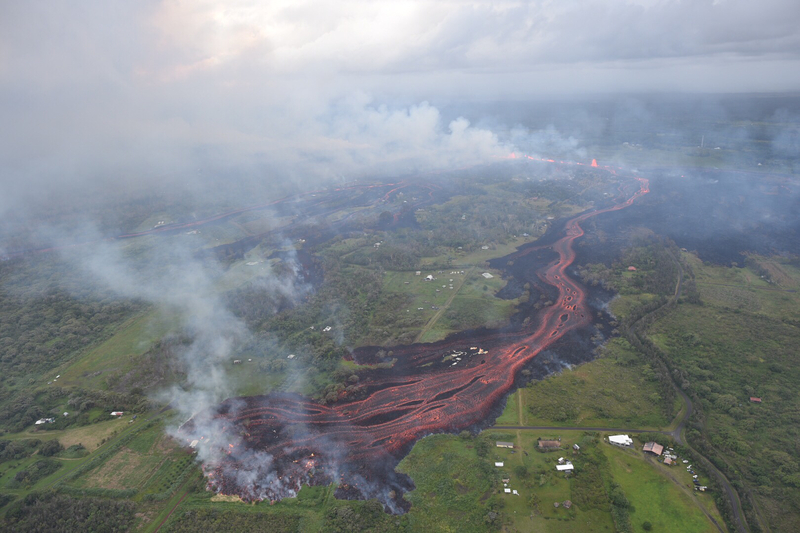 This USGS image taken in May 2018 illustrates the path of one of many lava flows associated with the eruption of Kilauea on the Big Island of Hawaii. The eruption temperature of Kīlauea lava is about 1,170 degrees Celsius (2,140 degrees Fahrenheit). Everything in its wake is incinerated. Many Native Hawaiians continue to revere Pele, seeing her as the primordial force that created and inhabits all the land in Hawaii. 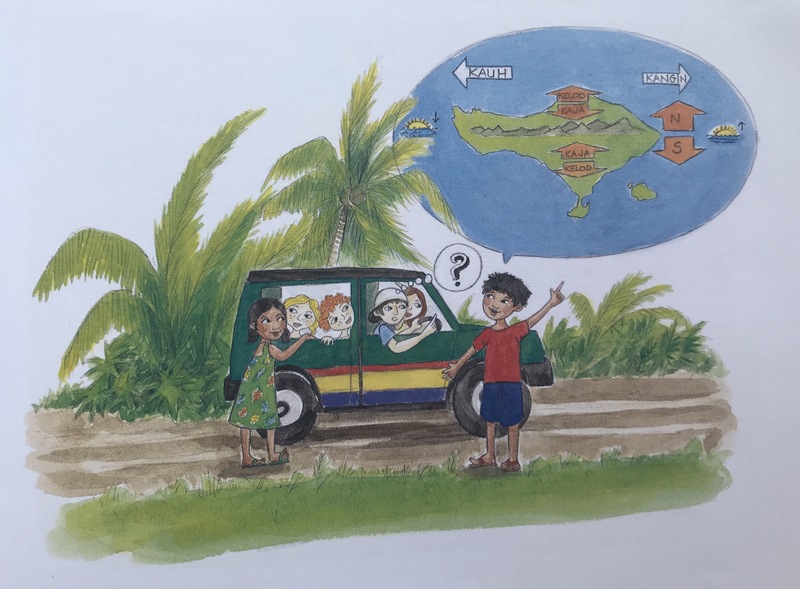 Offerings were made to her during the 2018 eruption and the uncertainty associated with her ‘dance around the island’ accepted. Similar offerings were made to Mt Agung in Bali during the eruptions that started in November 2017. Here it is Siwa, the Hindu God that represents the element of wind, that resides at the top of the volcano. In both Hawaii and Bali it was felt that the goddess and god were angry with the way their islands were being treated. The eruptions were ways of demonstrating their displeasure. In Bali the disruption to the tourist trade was considerable, one of the ways the impact of volcanic eruptions has changed in modern times. Mt Agung, two weeks before the eruption in late November 2017. Fortunately we missed the travel chaos associated with the volcanic activity in Bali. That was not the case in 2011 when the eruption of the Grimsvotn volcano in Iceland severely affected our travel to South America. 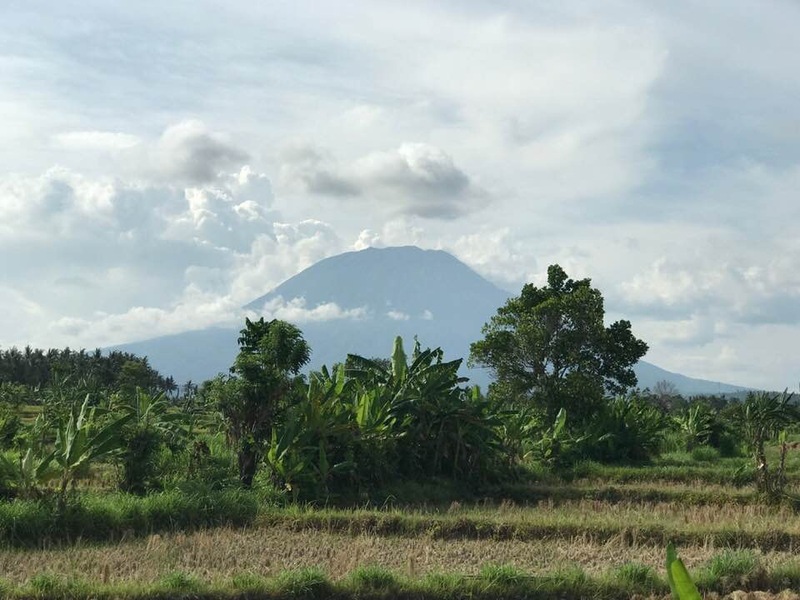 The importance of Mt Agung to the Balinese is immense. Traditionally the islanders find their way around in relation to the top of the volcano and the chain of volcanic mountains that splits Bali in two. The villages, temples, houses and even beds are also positioned in relation to the sacred direction of Mt Agung. Source: ‘My Life in Bali‘ by Sandrine Soimaud. Vulcanologists are scientists who study the processes involved in the formation and eruptive activity of volcanoes, past and present. They bring a different perspective to the understanding and appreciation of volcanoes, one that generally dismisses belief in deities such as Pele and Siwa. Instead Vulcanologists use a raft of measurements, models and observations to monitor and increase the capability of predicting a volcanic eruption. A subset of these scientists visit the craters of active volcanoes, a dangerous and sometimes deadly profession. Stanley Williams, who wrote ‘Surviving Galeras‘, lived to tell the tale of how he survived a volcanic explosion when he was in the crater. Some of this colleagues were not so fortunate. Sometimes volcanoes surprise and educate vulcanologists by erupting in an unexpected way. Such was the case in 1902 when a large cloud of hot gas and volcanic debris rushed down the side of Mt Pelee on Martinique killing 30,000 people in its path. This newly observed phenomenon was dubbed a “nuée ardente” meaning glowing or burning cloud. In modern terminology, this mix of hot gas and rock is classified as a type of pyroclastic flow, examples of which have since been observed during other volcanic eruptions, including Mount St. Helens in 1980. In some cases ice, water and mud can mix with the hot gas and volcanic rock as it is expelled. An elemental concoction indeed. 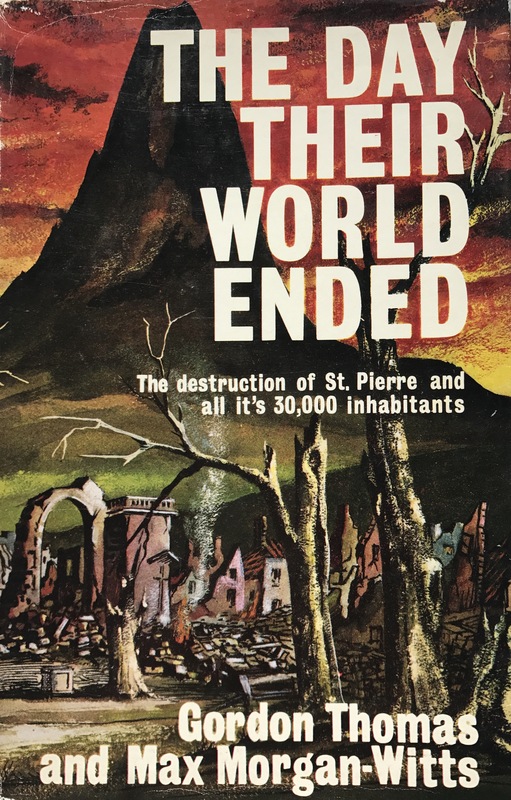 This dramatic book cover was my first introduction to the tragic events that took place at St Pierre when Mt Pelee erupted with such force in 1902. It ranks as the deadliest volcanic disaster of the 20th century, and the third deadliest in recorded history, after the 1815 eruption of Mt Tambora and the 1883 explosion of Krakatoa, both in Indonesia. It has been argued that Pelée’s eruption killed more people directly than either of these two volcanoes, whose impact took many additional forms, including starvation, disease and tsunamis. This time lapse sequence of the newly discovered ‘nuee ardente‘ volcanic eruption was taken on Mt Pelee by Alfred Lacroix 7 months after St Pierre was destroyed. The glowing cloud swelled to a height of nearly 4000 metres during its course down the mountain. Source: phenomena.org.uk. Another surprise associated with the 1902 eruption of Mt Pelee was the impact it had on the final location of the Panama Canal. At the time of the eruption both Nicaragua and Panama were being considered for the location of the canal that would connect the Pacific and Atlantic Oceans. Panama was chosen, in part it is argued because of the campaign against Nicaragua being unsuitable because of the 12 volcanoes found there. Pelee was said to be a “terrible object lesson” and that Nicaragua was a “volcanic menace”. The intense lobbying at the time appeared to have paid dividends. Other strong words have been used to described volcanoes and related earthquakes, with the book ‘raging planet‘ by Bill McGuire referring to them as tectonic threats to life on earth. His is one of 35 books I have collected on volcanoes as I scanned the bookshelves of second-hand shops. As can be seen below, erupting volcanoes are the poster-child of books on Planet Earth, natural disasters, incredible adventures and more. 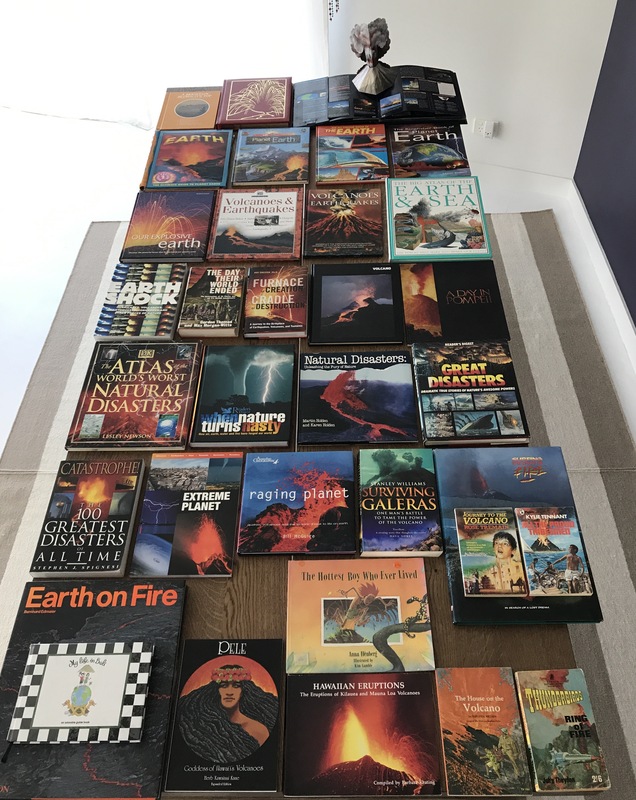 It was a surprise to me how many books related to volcanoes I had collected when I finished looking through my library. They demonstrate the fascination with the volcanic forces that embody nature’s elemental and explosive energy. Many of the encyclopaedic-style books contain excellent descriptions and diagrams of the formation of different kinds of volcanoes and their relation to tectonic plate movement. Because it has been done so well elsewhere, including on-line, this aspect is not covered in this blog. Kits to make volcanoes, educational toys aimed at boys, are popular. This is understandable when volcanoes both explode and are associated with the lair of villains in movies such as James Bond and Ninjago. 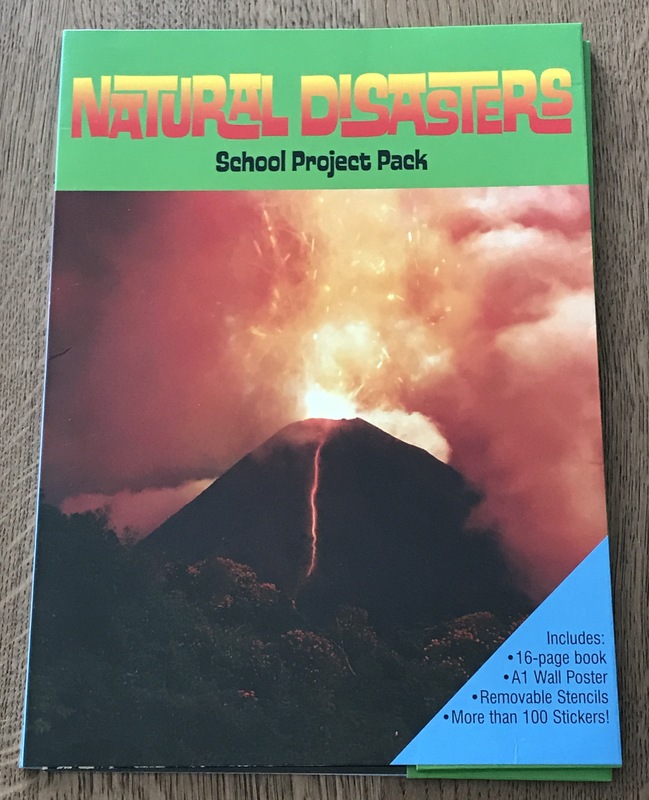 Volcanoes are also featured in School Project Packs, as shown below. 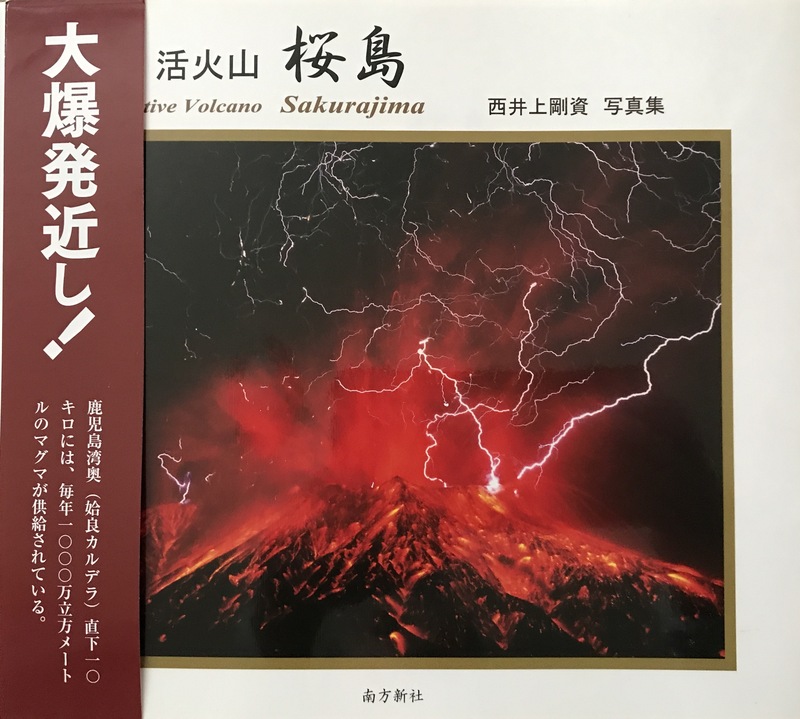 Another ‘natural disaster’ product, another volcano! This Student Project Pack, with all of its stickers and stencils, certainly enticed me to make a poster about them! It is not shown with the 35 books above as it was hiding elsewhere in my library. The cover is an impressive one. 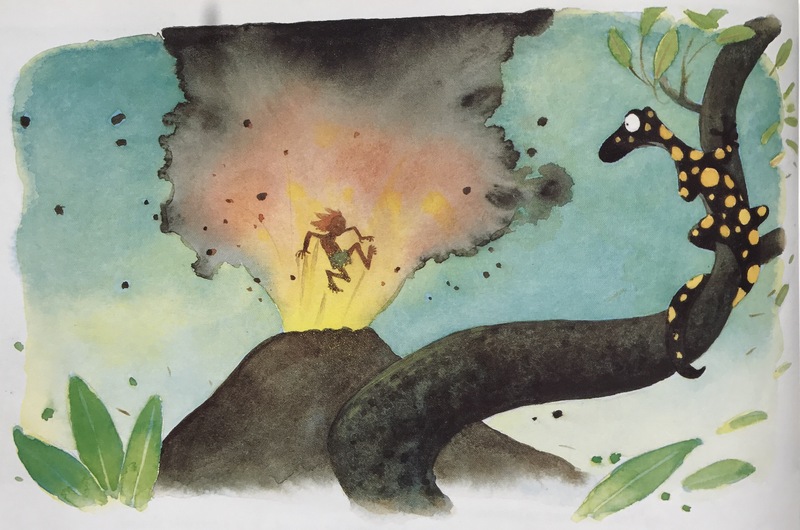 One of my favourite books about volcanoes is called ‘The Hottest Boy Who Ever Lived‘. Written by Anna Fienberg and beautifully illustrated by Kim Gamble, the book tells a story of the initial rejection, and final acceptance, of hot-skinned Hector when a wild storm led him to a Viking village. The moral is not to judge a book by its cover, or a boy by the colour of his hair and temperature of his skin! Accepting Hector for who he is could be a metaphor for accepting volcanoes for what they are – one of the powerful planetary forces that has shaped Earth and will continue to do so. I prefer this to the portrayal of volcanoes and other natural phenomena in the Reader’s Digest book ‘when nature turns nasty‘. Living with volcanoes is something that over 500 million people face on a daily basis, being close enough to be in danger when an eruption occurs. Working out ways to reap the benefits of volcanoes such as the nutrient rich soils they produce, while having mitigation and evacuation procedures in place, seems a prudent approach. 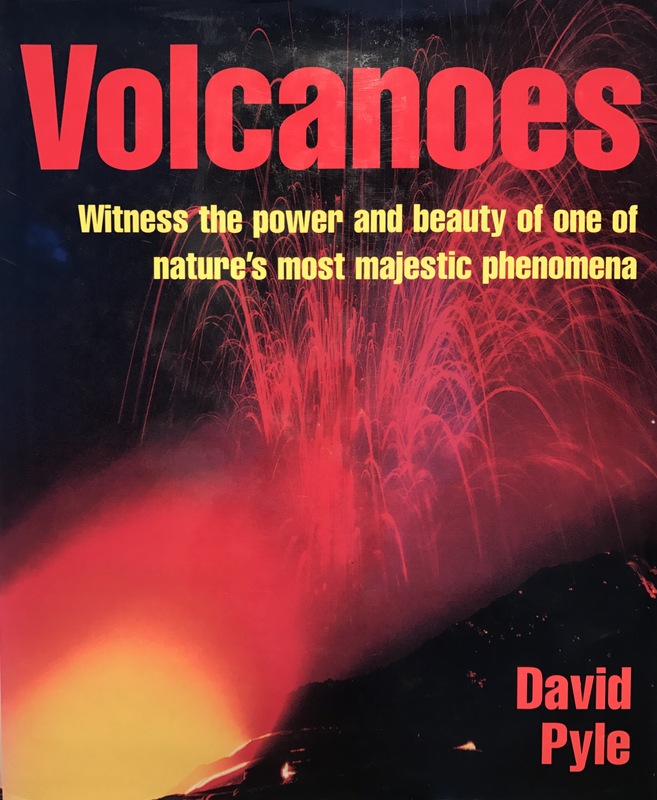 The title and message of this book by David Pyle, published in 2003, reflects my sentiments about volcanoes. I came across it after writing this post and was very pleased to find it. The book is well written and presented. Pyle’s recent book on encounters with volcanoes should be likewise. In June 2017 I spent a week in an apartment with a view of Sakurajima, an active volcano overlooking the city of Kagoshima in souther Kyushu, Japan. The volcano is the symbol of the city, with residents having a love-hate relationship with the mountain (or so the souvenirs say). My overall sense was one of pride and respect. 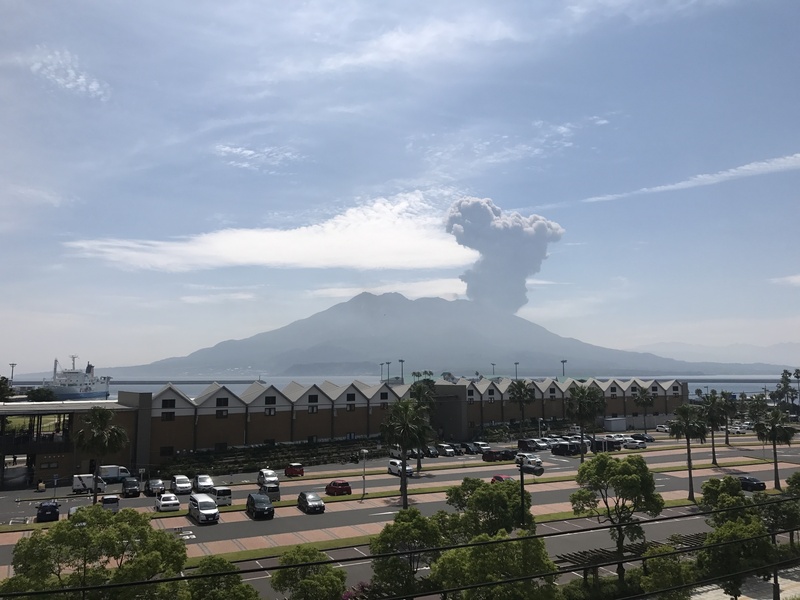 To learn more about living with a volcano in an urban setting I would recommend the Sakurajima-Kinkowan Geo-Park website. The spectacular image of Sakurajima shows lightning generated by the erupting volcano. Other amazing expressions of energy are found throughout the book. Sakurajima is one of 16 volcanoes worldwide that have been named ‘Decade Volcanoes’. These have been identified as particular worthy of study in light of their history of large, destructive eruptions and proximity to populated areas. The Decade Volcanoes project encourages studies and public-awareness activities at these volcanoes, with the aim of achieving a better understanding of the volcanoes and the dangers they present, and thus being able to reduce the severity of their impact. As described in the Wikipedia article, the program has had its ups and downs. Overall however it is reported that studies at many volcanoes have led to a clear reduction in the risk faced by nearby settlements, including Seattle in the USA where nearby Mt Rainier poses some danger. There is also a better understanding of the processes underpinning volcanic eruptions such as the importance of water in driving the eruptions of the Taal volcano in the Philipines. Managing the impacts of volcanoes at a local scale is one thing, eruptions that affect the global climate is another. A striking example of this phenomenon occurred in 1815 after the eruption of Mt Tambora in Indonesia. The ash from the eruption column reached the stratosphere at an altitude of more than 43 kilometres. It dispersed around the world and lowered global temperatures, in an event sometimes known as the ‘Year without a Summer’ in 1816. This brief period of significant climate change triggered extreme weather and harvest failures in many areas around the world. It is also said to have influenced the colour of the sunsets captured by JMW Turner in his paintings and the Mary Shelley’s writing of Frankenstein during the ‘year of gloom’. While these artistic and literary associations are fascinating, the main impact of the eruption was widespread devastation. 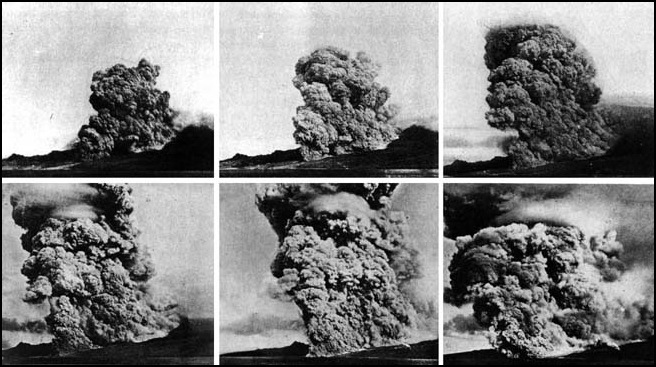 If a similar eruption occurred today it would cause severe and ongoing disruption to airline travel. The recent eruptions in Bali (Mt Agung 2017) and Iceland (Grimsvotn 2011), referred to earlier, demonstrate some of the potential impacts. 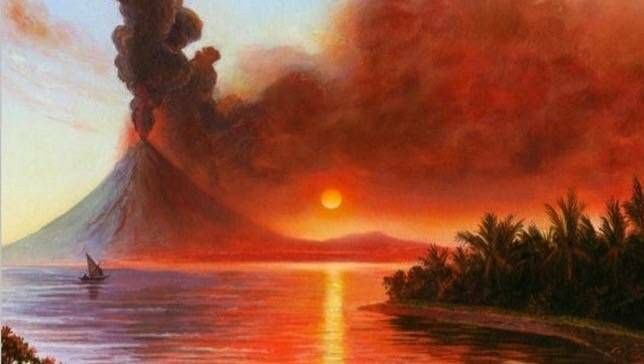 This artists representation of the Mt Tambora eruption in 1815 is a classic depiction of a volcano in action. It nicely illustrates the four elements of earth, fire, air and water – these interact in a variety of ways during volcanic events, as referred to through the post. Source: ‘The Year Without Summer‘ by Ron Woods. Mt Fuji is another classic volcano, perhaps the most recognised in todays interconnected world because of its near-perfect conical peak and imposing presence. 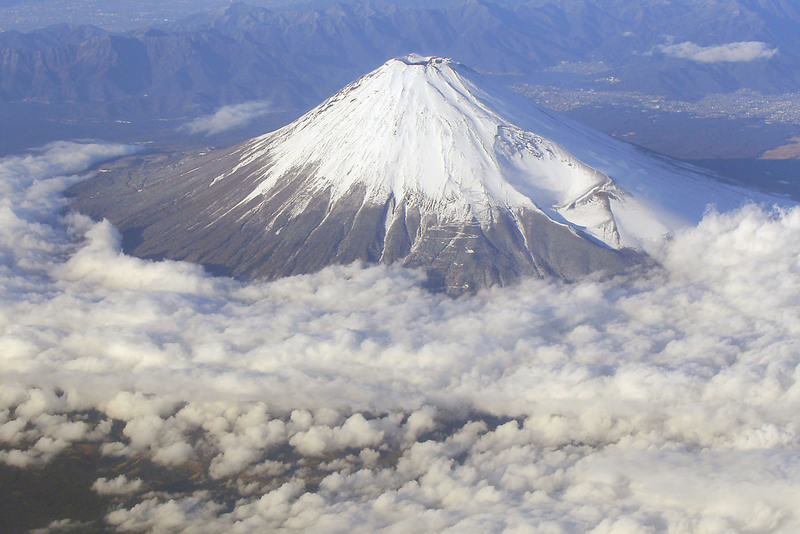 This sacred mountain most recently erupted in 1707, again associated with an earthquake. There was some concern that the major 2011 earthquake off the coast of Japan could also trigger an eruption. Earthquakes and volcanoes – both expressions of the volatile, connected and constantly moving earth, on and below the surface. Source: Japan Times, AP Photo/Itsuo Inouye. There is so much more that could be said and illustrated about volcanoes. A whole post could be written about Iceland for example – an island created by 130 volcanic mountains. It’s creation, history, geology, geothermal energy and volcanic eruptions are enthralling. It is one of the few places on earth that you can stand between two tectonic plates on land, and see a recently created volcanic island – called Surtsey and named after an Icelandic God of Fire. There are many other expressions of our active earth to explore in Iceland as well. What a marvellous elemental story. For now I will leave you with a map of the ‘Ring of Fire’ where 452 volcanoes are found, accounting for more than 75% of the world’s active and dormant volcanoes. It is also where hundreds of millions of people live. As the human population grows the interactions between people and the elemental energy of volcanoes is bound to increase. 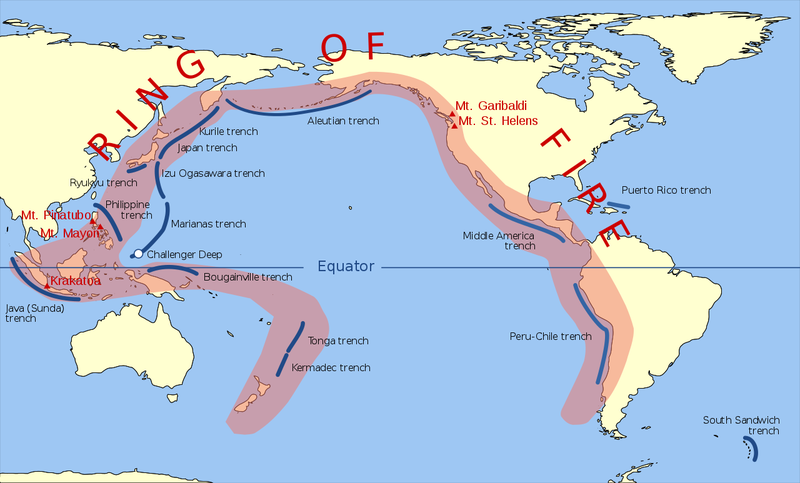 The Ring of Fire, a major area skirting the Pacific Ocean where many earthquakes and volcanic eruptions occur. Source: Wikimedia.org. This entry was posted in Air, Earth, Energy, Fire, Indigenous knowledge, Japan, Story telling, USA, Visual Arts, Volcanoes, Water and tagged Air, Bali, earth, Energy, Fire, Japan, Sense of wonder, Volcanoes, Water. Bookmark the permalink. I could definitely have kept reading about volcanos; there is clearly much to tell. I hope you do write a follow-up blog on the volcanos of Iceland. I didn’t think I’d get through the whole post tonight however once I started reading I couldn’t stop! Thanks for such an informative and interesting ‘take’ on the topic. There was a lot of material in those 35 books to share, plus a Student Pack I found afterwards. I didn’t even mention Pompei, one of the best known volcanic events in recorded history because of the footprint that was left. Then there is the intriguing subject of volcano tourism, Yellowstone National Park being a good example. I’m unsure how many people visiting the park to see the themal springs and geysers know that they are standing on a super volcano. They are ones that have the power to spew rock and debris over such a distance that it can alter the Earth’s atmosphere. Like the Mt Tambora eruption in 1815 that I referred to. I find it all quite fascinating, and very elemental!